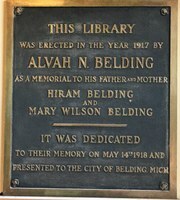 The Alvah N. Belding Memorial Library is located at 302 E. Main Street, Belding, Michigan. The Belding Library is a Class III public library serving residents living within the City of Belding, Otisco Township, the north half of Keene Township and Orleans residents living in the Belding School District. The Belding Library is a member of the Lakeland Library Cooperative and participates in MEL interlibrary loan and reciprocal borrowing with the other member libraries. The library's collection includes books, Playaways, DVDs, Books and music on CD, print and non-print periodicals. We also offer Downloadable Books, both audio and ebooks, through our online catalog. The Alvah N. Belding Memorial Library offers free to the public print and electronic reference resources, access to the Internet, Wi-fi service, and faxing services. Feel free to also search our extensive geneaological collection, view a library exhibit, or attend one of the library’s many events or programs. Our friendly and professional staff is eager to serve you. Welcome to the Belding Library! The Alvah N. Belding Memorial Library is a vital community resource for information and programs. It is free, welcoming, flexible, and empowering. The board and staff believe an open and free library is fundamental to a free society. We inspire the public's trust through strong partnerships. We value innovation, imagination and creativity while making wise use of our operational resources. We are committed to excellence in service and to full access to our facilities and resources. The Alvah N. Belding Memorial Library is governed by a five member Board of Trustees.